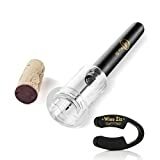 ⭐⭐⭐⭐⭐Top rated by BGR ★ The new air pump wine opener is a simple, easy and fast way to open up a bottle of wine without the hassle of pulling and twisting, simply slid the needle in, pump a few times and the cork is out. Eliminates cork damage. ★ The wine opener, comes with a durable blade foil cutter, The ZIZ Wine foil cutter removes the foil top from your wine bottle effortlessly, with a quick turn of the wrist and it's done, leaving your glass bottle looking great, with smooth edges and ready for cork removal. ★ Great for bar, cafe, restaurant or home use. smooth finish makes it very easy to clean. Excellent gift idea for wine lovers, Wine ZIZ is also giving you a no questions-asked Moneyback guarantee if you are not satisfied with your purchase. Click Add to Cart and Buy Now! ★ The new Wine Ziz air pump wine opener comes in just the right size to fit in your bag or travel bag. It is also lightweight, which makes it easily portable.